Rust Damage | Is it really that bad? Rust can really be a dangerous problem. Image from Flickr. A little bit of rust on your car may seem like just a cosmetic issue, but rust can be a much bigger problem. Rust on a vehicle can eat away at the components, the structure and the safety. If you do have rust in or on your car, the best way to handle it is with proper treatment. When metal is exposed to oxygen and water, it creates iron oxide, otherwise known as rust. Rust basically dissolves away metal. In a vehicle, this can be a major problem because the structure of a vehicle is made almost entirely of metal. When the metal dissolves, connections can start going bad. The car’s safety can also be compromised because the steel that creates crumple zones will dissolve. Rust in a vehicle is likely to happen in one of three major areas. First, painted surfaces. Scratches, scrapes and pits in the paint and wax can allow water in to the metal exterior of a vehicle. Rusted out paint doesn’t present a specific danger, but it can be a major indicator of something else going wrong. Second, frame and chassis structure can start to rust from use, water, salt, air and smog. When the frame or chassis starts to rust, it can eat away at the safety of the vehicle. Third, the engine and trunk compartments. Corrosion and rust in these areas will eat away and connectors, intakes and other important mechanical parts. Corrosion and rust can be difficult to detect in these areas, though, because the problems they cause will be intermittent. 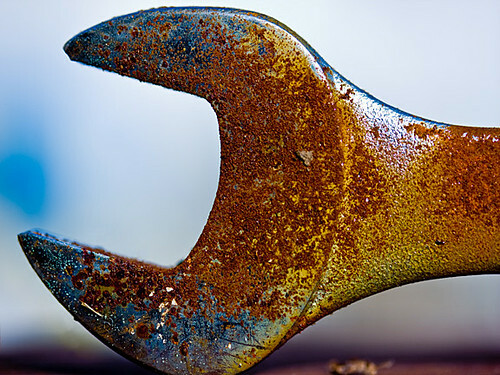 If you find rust anywhere on your vehicle, it is important to take immediate action. You have three major options. First, stop the rust. Use a spray or paint-on compound to stop the action of the rust. Second, remove the rust. Sand down the rusted areas and then reseal or recover the corroded area with paint, sealant or new components. Third, replace. If components are badly eaten away, replacing them may be your best option. Components, metal and rubber are all affected by rust – so replace not only the affected part, but anything that is starting to show rust damage. Does the Electronic Rust Protection proven to work?